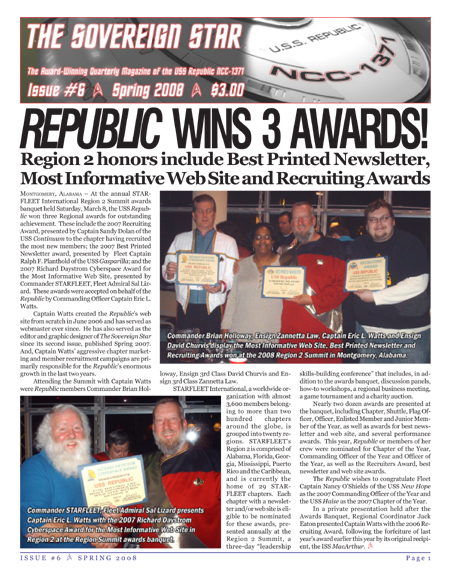 Feature Article: "Republic Wins 3 Awards! 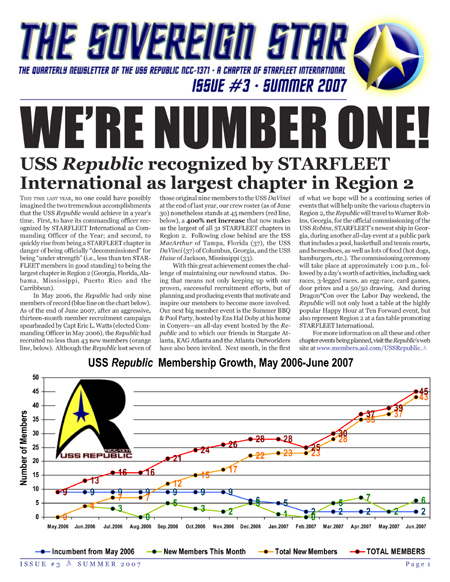 Region 2 honors include Best Printed Newsletter, Most Informative Web Site and Recruiting Awards"
PLUS: Chapter Activity Report, Crew Manifest, Quartermaster's Report, Starfleet Academy Graduations, Upcoming Events and more! Feature Article: "Member of the Year! Ens Zannetta Law wins first annual award based on membership participation and achievement"
Feature Article: "Double Honors! 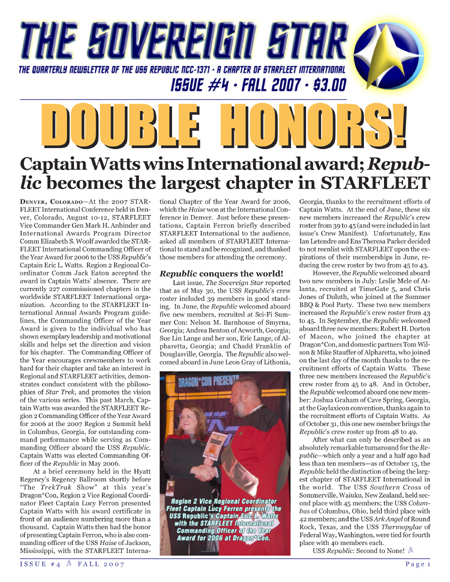 Captain Watts wins International award; Republic becomes largest chapter in STARFLEET"
Feature Article: "We're Number One! 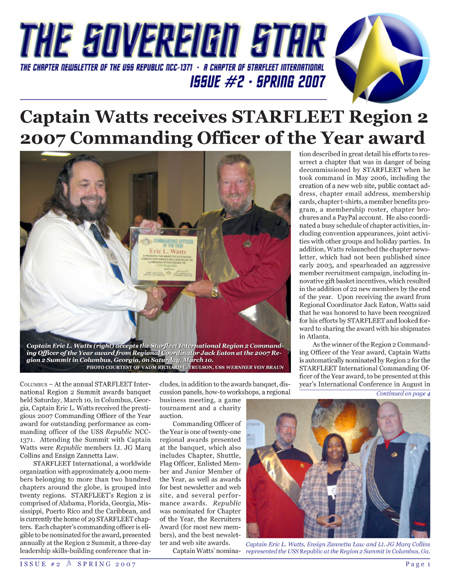 USS Republic recognized by STARFLEET International as largest chapter in Region 2"
Feature Article: "Captain Watts receives STARFLEET Region 2 Commanding Officer of the Year award"
PLUS: Chapter Activity Report, Crew Manifest, Quartermaster's Report, Starfleet Academy Graduations, Member Benefit Partners, Upcoming Events and more! 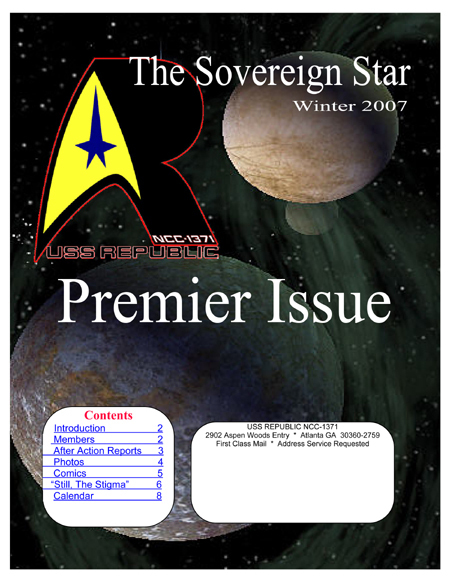 PLUS: Chapter Activity Report, Crew Manifest, Upcoming Events, lots of photos and more!